Daoust and Baker sit among a Siwa tote bag by Naoto Fukasawa, Cutter benches and shelves by Niels Hvass, and Dots wall hooks by Tveit & Tornøe for Muuto. 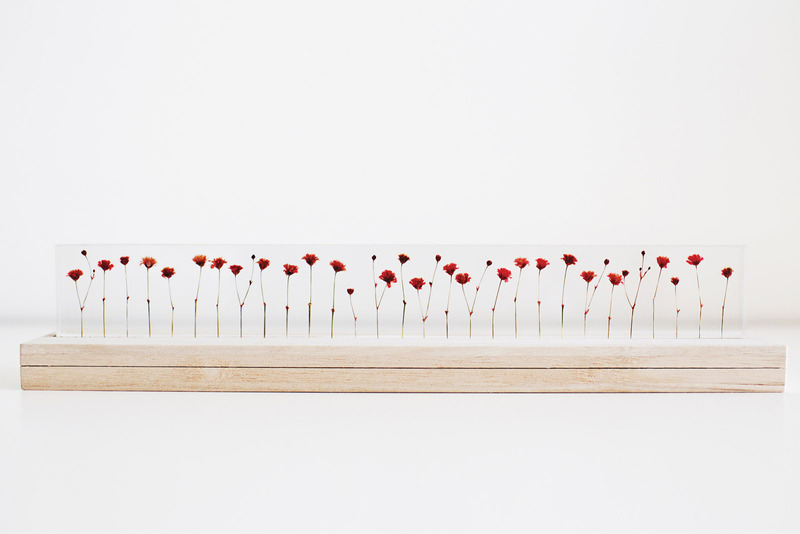 Studio Note’s f,l,o,w,e,r,s ruler features handpicked, dried flowers embedded in acrylic in one-centimeter intervals. Wood is a favorite material of owners Daoust and Baker, who select pieces that show off the natural grains of each cut. 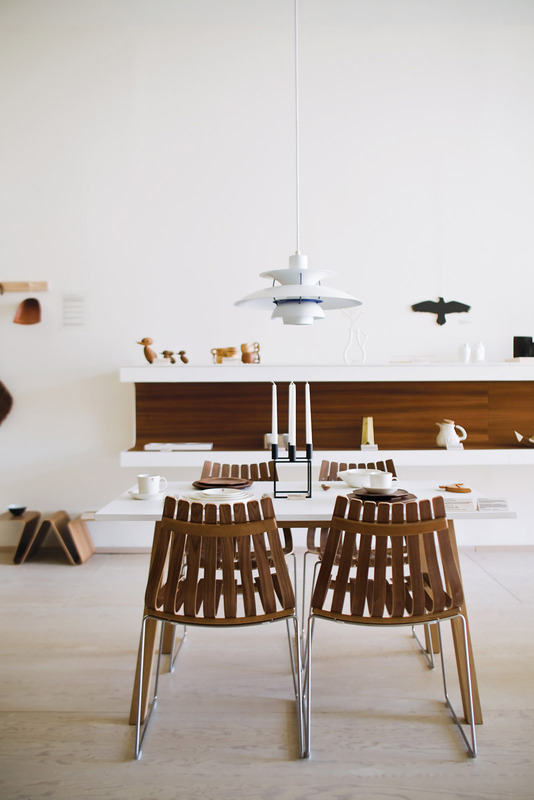 At the shop, Poul Henningsen’s PH 5 lamp for Louis Poulsen hangs over the Sandra table by Thomas Sandell for Asplund and Scandia chairs by Hans Brattrud for Fjordfiesta (top left). Despite its message-in-a-bottle appearance, this product is in fact a glass carafe and stick of kishu binchotan (coal). The coal purifies drinking water and improves its overall taste. One of the many tea pots sold in the shop, though the inventory is constantly in rotation as Daoust and Baker discover new talent and products on their scouting trips to Scandinavia and Japan. 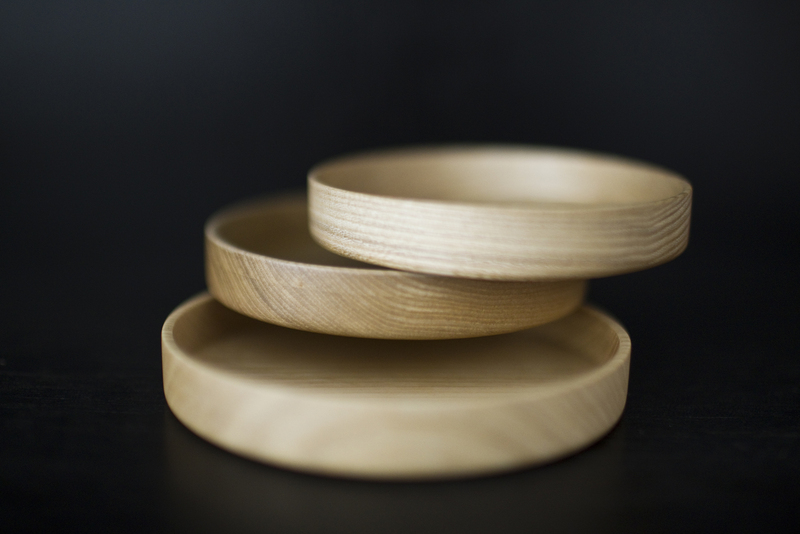 Oji Masanori’s wooden Kami cups and mugs are handcrafted in Japan and are made from castor aralia wood, shaped using a potter’s wheel and coated with a food safe resin. Visit Mjölk in Toronto, Ontario, Tuesdays through Sundays at 2959 Dundas Street West or shop online at mjolk.com. Watch our slideshow of Daoust and Baker's favorite products in the shop. Juli Daoust and John Baker broke the cardinal rule of retail when they opened Mjölk in 2009. “You’re supposed to pick a name people can pronounce,” Daoust says. 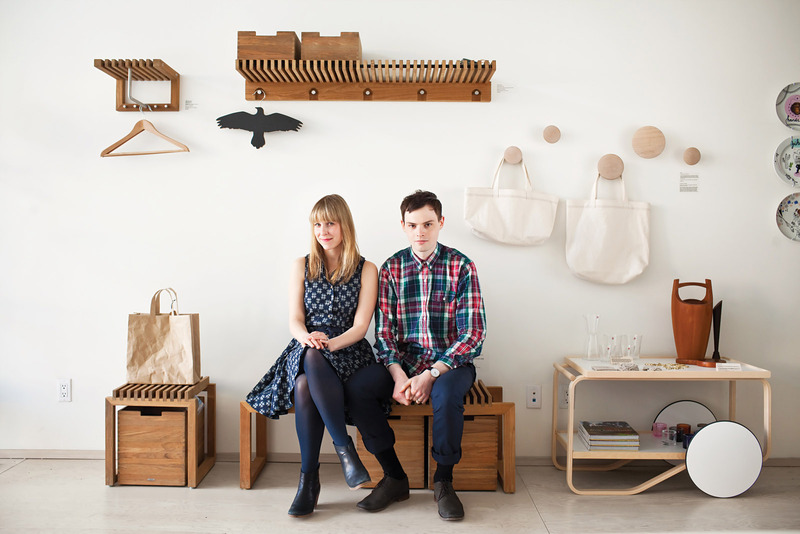 Instead, the couple chose a moniker that pays homage to Nordic traditions and describes both the Scandinavian and Japanese design aesthetics the shop specializes in. Pronounced “mi-yelk,” mjölk means “milk” in Swedish. “Sweden’s Arla milk packaging has won a number of awards, and its design really stuck with us,” Baker says. “The words that characterize milk are the same ones that describe the two regions’ design aesthetics: pure, simple, sensual.” The store echoes those sensibilities with its crisp interiors and carefully curated items by artists that Daoust and Baker met on scouting trips to Japan and Sweden and its neighbors. Though it may seem a stretch at first, the items from abroad feel perfectly natural in the Toronto shop. “The climates and experiences in Japan and especially in Scandinavia are so similar to ours in Canada,” Daoust says. “It’s easy for us to connect with them.” So while the name may be foreign, Mjölk’s wares feel right at home. Daoust: We're not painters, we're not makers. We're people who are creative in other ways, like being able to curate a shop. Plus, it's in John's blood. Baker: My grandpa had a hardware store and a camera store. My dad manages a car dealership. You opened in 2009 during tight economic times. Baker: There's always a second coming of modern design in response to a recession: Alvar Alto bent wood because steel became too expensive. Iittala simplified its designs because it was too costly to be ornate. We knew people were either going to buy the cheapest things possible or start looking at disposable products as unsustainable and begin investing in products for the long run. What drew you to Toronto’s Junction neighborhood? Baker: Downtown became so expensive, and that pushed people either east or west. In the past five years, this area has really become a destination. A lot of young, independent businesses have popped up, starting with reclamation stores Smash and Post and Beam. There’s also Crema Coffee Co., Pandemonium Books & Discs, Junction Fromagerie (a Quebecois cheese shop), and Bunner’s gluten-free vegan bakery, to name a few. Daoust: I’ll be making something or getting dressed and wish I had a better can opener or a better shoehorn. Then, I try to find the best one there is. Everything we put in the store is something we would want in our house. It all ends up upstairs in our apartment at some point. How do you grapple with the common perception that foreign design costs more? Baker: But we recently counted all the things in the store under $100 and there are hundreds. It actually ­surprised us! You worked with Christine Ho Ping Kong and Peter Tan of Studio Junction on the interior design; how was that collaboration? Baker: A lot of our ideas for the store were things they had already executed. We wanted a curved wall, and they had recently created one for an exhibition at the iconic Gladstone Hotel; after the show they said, why don’t we use it in the store? Christine and Peter are master manipulators: If you’re seeing something not quite right, they’ll help nudge you in the best way. Why do you host exhibitions in the space? Baker: Everything has a story. By having an artist come in during the exhibition, walk around, and talk to people, costumers know if they buy one of his pieces, they're supporting this great designer who can continue to work. Japanese artist Oji Masanori signed the backs of plates for people when he was here. It was amazing. What's next for the shop? Baker: We went to Japan twice in a row to source products and just got back from Scandinavia--Reykjavik, Copenhagen, Stockholm, Helsinki. Norway Says was one of our favorite design firms; we were so sad when they split in 2009. But now we get two new companies--Andreas Engesvik and Anderssen & Voll--that are both doing amazing things. We're also redesigning our site and finally launching an online shop. Catch our slideshow of Daoust and Baker's favorite products in the shop.